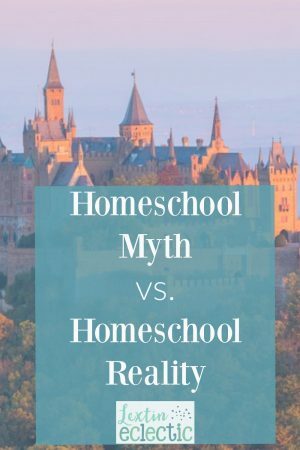 Let me debunk of few myths about homeschooling. If you’re like me you probably had ideas swirling in your head of how your homeschool days would look. I envisioned kids curled up on the couch in jammies while we read together, all of us sitting around our large table while everyone colored or worked, beautiful history projects on display around our house, impressive and fun science experiments, going for nature walks, sitting on our patio to do school, cooking together in the kitchen, and no traces of a textbook or a workbook. Unfortunately those have not exactly been our experiences. Sure, we do have days that are beautiful, but most of our days are less than perfect. Initially I was a little discouraged that our reality didn’t line up with my vision. But I’ve learned to accept the beautiful mess and the barely controlled chaos that is our homeschool life. I read to the kids as they sit in beanbag chairs on the floor while fighting over crayon colors. I’m holding the baby who is fussing so I march up and down the room bouncing and swaying while I read and try to keep her happy at the same time. I carefully time my breaks to take a breath to the moments when she bursts out screaming or squealing-I read while she takes her breaths. We do our school work in shifts. hen we rotate and shift and change. It’s just me and one other child in the homeschool room. When I had the vision of all of us sitting in the homeschool room together I must have had it on mute. I totally forgot about the impressive noise level of 5 children. We don’t do any projects right now. I don’t have the time or organization to run to the store for all the random craft supplies. I don’t have the patience to coordinate the project. Nor do I have the time to finish off all the tiny details of each project when my kids lose interest and wander away. So I don’t have any projects – messy projects, detailed projects, half-finished projects – littering my house. I’m finding it rather freeing this year. Our science experiments are not happening very often for the same reason that we’re skipping most history projects. I don’t want to gather supplies; I don’t want to direct the cleanup; and I don’t want to clean up the aftermath. Instead I have science DVD’s that we watch and some of them even demonstrate experiments. We read books about science topics and we make notebook pages. I’ll save the experiments for when they are a little older – and can help clean them up! We live in a huge subdivision. The only “nature” that we can find is the leftover bricks and rocks from the construction projects nearby – ohh and all the trash from the construction. Somehow walking past all the neighbor’s nicely manicured lawns is not inspiring. Not to mention, that our neighborhood is very very hilly and hiking up and down those hills while pushing a huge stroller and trying to corral the kids does not make me want to stop and smell the roses. Ohh, I guess we could go find a park that has a more natural setting but that requires loading up all the kids, our gear, the snacks, the drinks, and then going to the park which inevitably does not have a bathroom. Nature DVD’s and IMAX shows are my answer for now! Patio school sounds so nice. I even have a beautiful patio table and comfy chairs. And we have a really nice patio – I even put some potted plants out there. The reality is……I forgot to water the plants and they died. If we sit on our patio during the day all we can hear is the construction on the new homes in our neighborhood and the obnoxious barking of the neighbors’ dogs, ohh and all the construction trucks as they rumble by. Here in south Texas it’s usually blistering hot so I don’t feel like literally sweating through grammar and math – they cause enough angst without the added perspiration. And on the few days that it’s actually nice, I’d rather just play outside. So, school happens indoors in the air conditioning with some lovely classical music in the background to drown out the sounds of hammers and saws. I dreamed of cooking lots of wonderful breads, muffins, and cookies during our school day. Then we’d always have fun snacks for when we need a break. I wanted to teach my kids how to cook and spend our time decorating our treats. Instead, I have a frenzied day of prepping and cooking on Sunday – during which time they are not allowed in the kitchen. I cook and cook and prepare and then clean. After that, I have everything prepared or ready for the weeks worth of meals. During the week, the thought of dirtying more dishes than absolutely necessary makes me want to cry. And have you ever tried to cook with 4 small children helping you? Well, good luck getting the right amounts of each ingredient in the bowl! We had a few disasters and I’m retiring as head of our cooking school for now. I thought I’d only use living books and never ever ever let a workbook in my house. I would create wonderful unit studies and we’d do projects and simply explore. I would inspire them and my children would challenge me with thought-provoking questions. Instead, my kids usually just want to do school and have it done for the day because they have all kinds of creative ideas to implement. I’ve found textbooks to be very timesaving and economical. I get tired of the library trips to hunt down all the living books and my book budget is shrinking (as is the space on my bookshelves). Workbooks are also efficient and my kids can complete many of them independently. I can get two things done at one time! I can work with one child while the other works in a workbook. Ohh and all those unit studies that I was going to create? That would mean hours of research on my part-finding resources, planning, printing, cutting, copying…….I don’t want to spend my spare time that way. So, instead, we use a very eclectic mix that includes textbooks and workbooks and we spend less time on school and more time on play. But I think I’m ok with the balance that we’ve found. Does your homeschool look different than you originally envisioned? Have you changed your homeschool plan over the years? Oh my goodness Lexi! Thank you for the real homeschooling day instead of the pie-in-the-sky day that some give us. Yes, this is life as the mom, cook, maid, teacher, researcher, driver, baker, plant waterer, etc. Thank you!!! I was needing a reality check! While we have a very supportive homeschool group and co-op, I can still feel like I dropped the ball at times. I dreamed of my kids helping me in the kitchen, them loving it, learning living math while doing so, the food being edible and the kitchen ending up clean! Bahaha! My daughter has no desire to learn (yet) and my son just likes to mix random things together and make messes. I was feeling horrible for having given up on that for now. Your honesty about school on the patio, nature walks and science experiments has truly been an encouragement for me! Thank you!